Hands down, Star Wars is my favorite for just about everything including costumes. Luckily my boys love it too, so I’ve come up with quite a few DIY Star Wars costumes over the years. I also have friends who’ve made awesome Star Wars costumes. So I decided to round up lots of amazing DIY Star Wars Costumes to share with you. 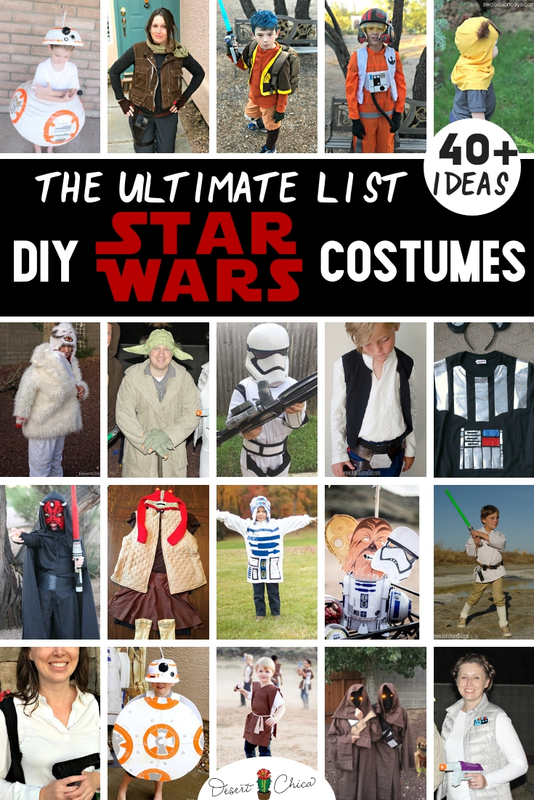 Below you will find over 40 DIY Star Wars costume ideas, hopefully, one or two will inspire your Halloween costume this year! Last Halloween, the boys and I dressed up as 3 fairly new Star Wars characters: Jyn Erso, Poe Dameron, and Ezra Bridger. Peter kept it easy with a Boba Fett mask and costume t-shirt. I’ve actually worn a Leia on Hoth Costume a few times. I’m never gonna pull off a Slave Leia costume but luckily Leia’s Hoth costume is pretty cool and comfy too! I’d actually like to dress up as General Leia Organa from the last two movies. It’d be a fun costume pair with Quinn’s Poe Dameron Pilot Costume and our BB-8 costume from a few years ago. I often use duct tape when making costumes and Elliot’s BB-8 costume was no exception. It was, however, my first costume utilizing a paper lantern! Going back earlier in the Star Wars saga, we have the Ezra Bridger Costume from Star Wars Rebels and Jyn Erso Costume (Coming Soon) from Rogue One. This Luke Skywalker Costume and Han Solo Costume come from a fellow Star Wars super fan. I love how she uses a lot of regular clothing to create her costumes just like I do. My BB-8 costume isn’t the only fun idea for everyone’s favorite rolling droid. Check out this 2-D BB-8 Costume. There are also several different R2D2 costumes ideas to choose from including this R2D2 Costume, or this R2D2 Costume, and this R2-D2 Dress. R2’s tall buddy may be annoying but this C3PO Costume would be fun to pair with R2-D2. I am not a fan of the Dark Side when it comes to Star Wars characters. My least favorite character is Kylo. I can never forgive him for Han, plus is whiny angsty attitude is annoying! But some people apparently do want to dress up like him, so check out this DIY Kylo Ren Costume. My friend Sara has both a Darth Maul Costume and Darth Vader Costume on her site. Both look fairly easy to pull off. Here is another idea for a Darth Maul Costume. My favorite Star Wars “villain” costume is the Wampa Costume that my mom wore a few years ago. She really creeped the boys out with it. 😉 The Wampa hat we found at Disneyland inspired the costume but we really lucked out with the crazy white fur coat we found at a thrift store! Skipping right past the dark side on to the light side. We have ideas for rebel forces and jedis! If you want to pair the light side with the dark side and have a good time doing it, check out these super fun LEGO Star Wars Costumes. One is a LEGO Darth Vader and the other is a LEGO Luke Skywalker! Sometimes a good Halloween accessory is all you need to make or break a costume. Check out these awesome DIY Star Wars costume accessories. My one and only Run Disney event was the inaugural Star Wars Marathon weekend at Disneyland a few years ago. I ran as Boba Fett, it was an easy running costume with a green running skirt and Boba Fett costume shirt. I also did a fun run at Walt Disney World for DisneySMCC and wore a Han Solo Running Costume. What Star Wars costume should I make next?